A technology-based instructional tool—developed and evaluated through IES funding—will now be put it to use in hundreds of schools across the country with the goal of improving students’ literacy outcomes. The United2Read Project was recently awarded a five-year Education Innovation and Research (EIR) expansion grant from the U.S. Department of Education. The EIR grants provide funding to develop, expand, and evaluate innovative, evidence-based programs designed to improve student achievement. A2i (pictured right) includes a series of assessments to measure component literacy skills of students and provide information that teachers can use to individualize literacy instruction in Kindergarten through Grade 3. The assessments cover a wide range of literacy skills, including vocabulary, decoding, word reading, spelling, sentence and paragraph writing, comprehension, and inferencing. A2i assessments are given throughout the school year to monitor student progress, and A2i’s algorithms are updated in real-time to provide teachers with recommendations for instruction for each student and changes to grouping. This project demonstrates the critical role IES plays in supporting research to develop innovative teaching and learning products and test those products for efficacy. Over the past 13 years, A2i was developed, evaluated, and scaled with a progression of awards from IES, as well as the National Institutes of Health/National Institute of Child Health and Human Development (NIH/NICHD). With a 2004 IES research grant, researchers at the University of Michigan and Florida State University conducted basic research to understand how the effects of different types of literacy instruction (e.g., phonics vs. meaning focused) depend on children’s constellation of language, phonological awareness, decoding and encoding, and comprehension skills. The team then used the findings from this initial work to build and test an initial version of A2i with first-grade students. The research demonstrated that instruction tailored to students’ skills and learning needs, and adjusted over time, is more effective than one-size-fits-all approaches. With a 2007 IES research grant, the researchers expanded A2i into second- and third-grade classrooms. They also tested the effects of implementing the system with second-grade students who had received A2i-informed instruction in Grade 1, as well as those who had not. With a 2013 IES research grant and grant support from NIH/NICHD, researchers at Florida State and Arizona State conducted seven randomized controlled studies examining the impact of A2i on student reading. The results suggest that individualizing literacy instruction with A2i recommendations led to stronger literacy gains for K-3 students. On average, students who used A2i across multiple years ended third grade reading at a grade 5 level. The research included students who qualified for the National School Lunch Program and who received special education services. 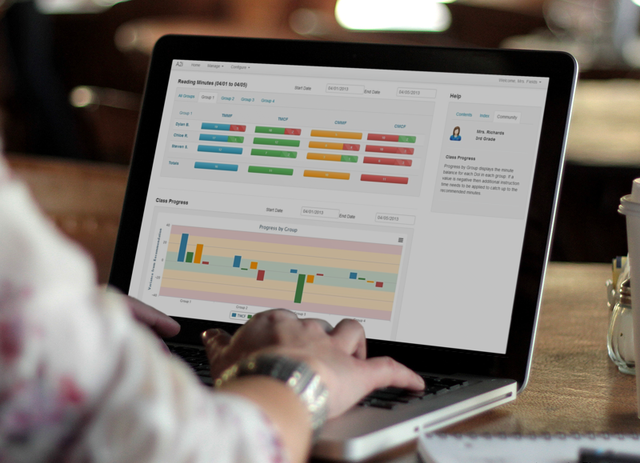 With a 2013 IES research grant to Arizona State University (which was later transferred in 2016 to University of California, Irvine) and a 2014 award from the ED/IES Small Business Innovation Research (SBIR) Program to Learning Ovations, an education technology development firm, the researchers upgraded the underlying data architecture of A2i to enable scale and implementation in classrooms across the nation. Research results demonstrated that the more teachers viewed student test scores, the greater the students’ literacy skill gains. The new EIR expansion grant was awarded to a consortium of researchers and developers, including researchers at UC Irvine, Learning Ovations, Digital Promise (a non-profit), and MDRC, a national evaluation firm. At least 300 schools and 100,000 students will be served through the grant, which will also support a large-scale effectiveness trial to measure the impact of the project on student reading achievement. Ed Metz is a Research Scientist at IES, where he leads the SBIR and the Education Technology Research Grants programs. Erin Higgins is an Education Research Analyst at IES, where she leads the Cognition and Student Learning Research Grants program. 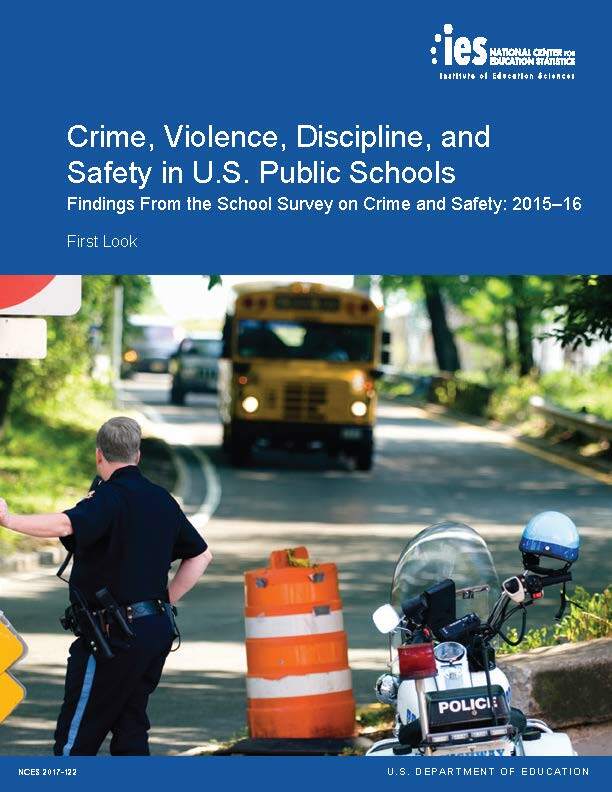 For more than 15 years, the National Center for Education Statistics has administered the School Survey on Crime and Safety (SSOCS) to provide timely, high-quality data on crime and safety in U.S. public schools. Information collected on SSOCS includes the frequency and nature of crime; disciplinary actions; crime prevention and the involvement of law enforcement; and challenges to reducing and preventing crime. Conducted with a nationally representative sample of public schools, the sixth, and most recent, administration of SSOCS took place during the 2015–16 school year. The first report highlighting key findings from that survey was released in 2017. Staff training in discipline policies and practices, including those related to bullying and cyberbullying or strategies for students displaying signs of mental health disorders. While previous administrations of SSOCS have asked schools to report the number of hate crimes that occurred during a given school year, the 2015–16 questionnaire asked schools to also report the bias (e.g., national origin or ethnicity, gender identity, etc.) that may have motivated these hate crimes. For the first time, the SSOCS questionnaire also asked schools to report the number of arrests that occurred at school. In addition to these new and expanded questions, SSOCS continues to collect detailed information on schools’ safety practices, the number and type of crime incidents (e.g., sexual assault, physical attack or fight) that occur at school, and the extent to which schools involve law enforcement, parents, and other community groups in their efforts to reduce and prevent crime. To allow for trend comparisons, many items included on SSOCS questionnaires have remained consistent between survey administrations. Due to the sensitive nature of SSOCS data, researchers must apply for a restricted-use license to access the SSOCS:2016 restricted-use data file. A public-use data file, with some variables removed, was released in March of 2018. Public-use data files from previous SSOCS administrations are also available on the SSOCS website and in DataLab.